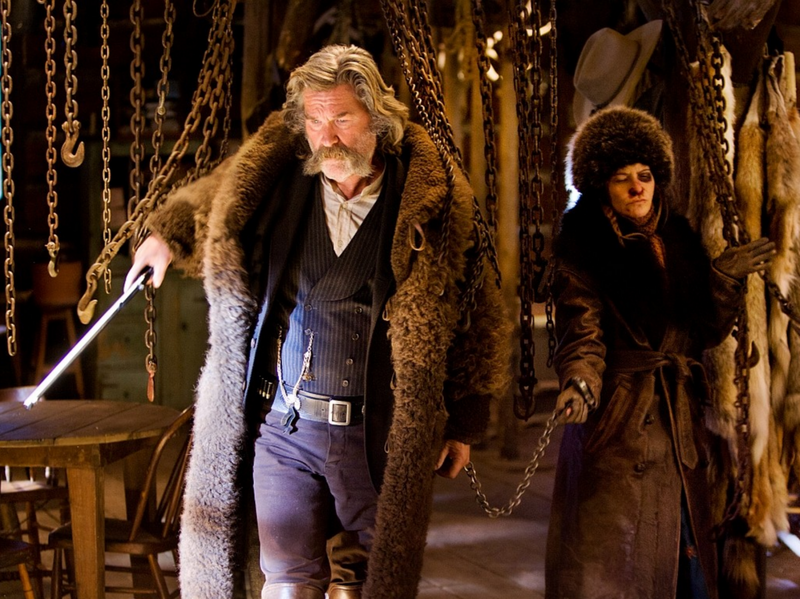 An over-long and talkative western mostly confined to one set, The Hateful Eight is filled with shady characters and buckets of gore, but lacks essential depth. 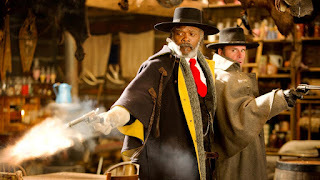 Years after the Civil War, Union Major Marquis Warren (Samuel L. Jackson) is making a living as a bounty hunter. He hitches a ride on a stage coach hired by John "The Hangman" Ruth (Kurt Russell), another bounty hunter with a reputation for capturing criminals alive rather than dead, and then ensuring that they hang after due process. Ruth is escorting his prisoner Daisy Domergue (Jennifer Jason Leigh), worth $10,000, to Red Rock to stand trial and likely hang. After taking Warren on board, he also pick up the stranded Chris Mannix (Walton Goggins), who claims to be the incoming sheriff of Red Rock. With a fast-approaching blizzard making the journey impossible, the wagon has to stop at Minnie's Haberdashery, a trail lodge. Minnie and her husband are missing, immediately arousing Warren's suspicion. Instead, the lodge is occupied by a dubious bunch including Marco the Mexican (Demián Bichir), English Pete Hicox (Tim Roth), who claims to be Red Rock's hangman, the burly Joe Gage (Michael Madsen), and the elderly Confederate General Sanford Smithers (Bruce Dern). Ruth and Warren have to guard against each other and figure who is who and what everybody's motive is. 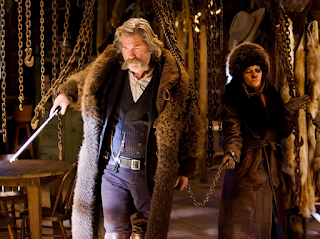 One of Quentin Tarantino's relatively weaker efforts, The Hateful Eight spends 167 minutes trying to find a boiling temperature, but regularly misses. Despite the focus on one location and ample time to build momentum, Tarantino's script is a muddled, off-form mishmash of ideas that rarely connect. Halfway through, the movie even resorts to sudden, unconvincing narration to explain unnecessary complexities. The first half of the film is exceptionally garrulous, with scene after scene of men talking at each other but achieving little intellectual penetration or character nuance. Not much happens, and the languid build-up fails to pay-off in any sort of reward. Once the bullets start flying Tarantino immediately resorts to his signature excessive gore, and plot elements suddenly start tumbling forth, undermining most of what happened in the first 90 minutes. When the characters start to finally reveal who they are, the plot is exposed as standard western fare and it becomes clear that most of the talking was an exercise in time badly invested. Tarantino tries too hard to find trademark dialogue highlights that can become pop culture landmarks. In the most egregious example Jackson's Major Warren delivers a long-winded vulgar story to goad Dern's General Smithers into reaching for his gun, but the tall tale twists in the wind with no context and is a case of way too much pepper and not nearly enough steak. Still, with a cast that includes veterans Jackson, Russell and Dern, there is sufficient quality to maintain a basic level of interest. The film looks good, with Minnie's cavernous Haberdashery offering plenty of interesting corners and props. Ennio Morricone's score is rich without being particularly memorable, and Tarantino finds plenty of picturesque snow-dominated landscape shots. Jennifer Jason Leigh, tougher than most criminals, holds her own in a cast filled with tough hombres and gains in prominence as the film progresses. The Hateful Eight is passable, but certainly bloated.